Today I did what I had hoped to do yesterday, but I painted a temple instead. So, this afternoon, I sat down with my studio palette and decided to take a good look at the yellows I have, use them individually, as well as mix them. 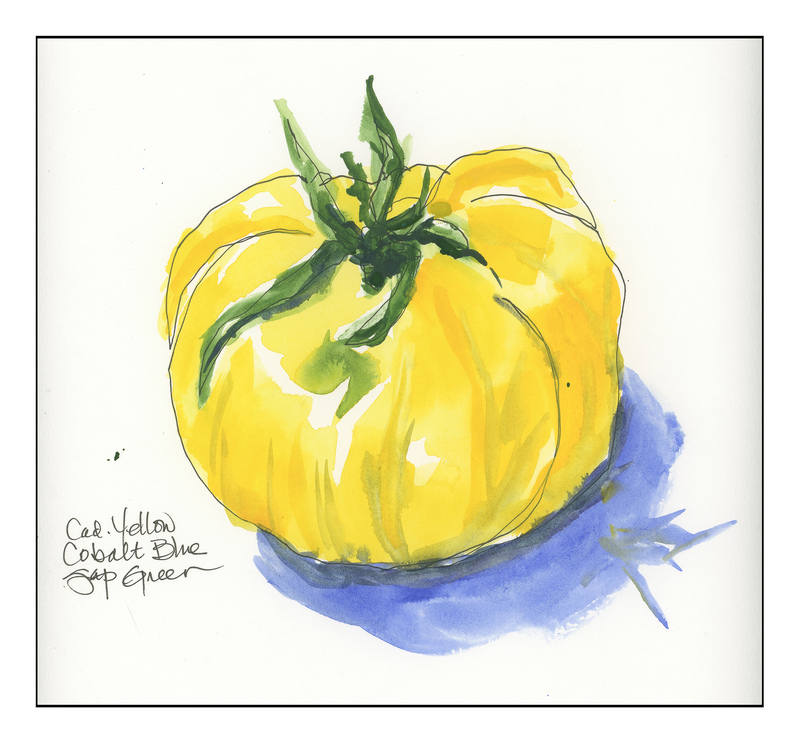 The colors include aureolin, new gamboge, raw sienna, cadmium yellow, hansa yellow, quinacridone gold, raw sienna, and “mystery yellow,” named thus because I didn’t label it! Above are my first paintings, mixing colors and not happy with the results. 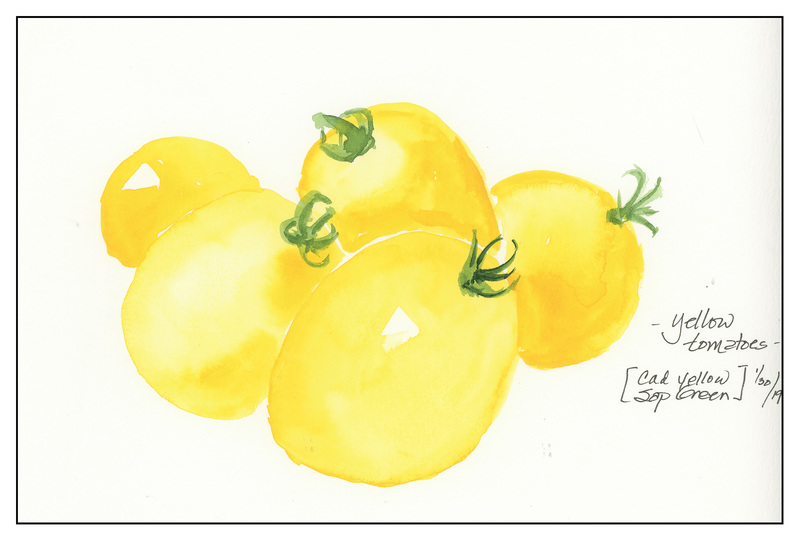 So, I did pure color studies of the lemons to see what I could get. Above, pure colors in varying densities to see what they could do. It was quite interesting! In the studies using only one yellow, I varied the density of the paint from very watery to rather heavy. I did the same in the above picture with sap green. 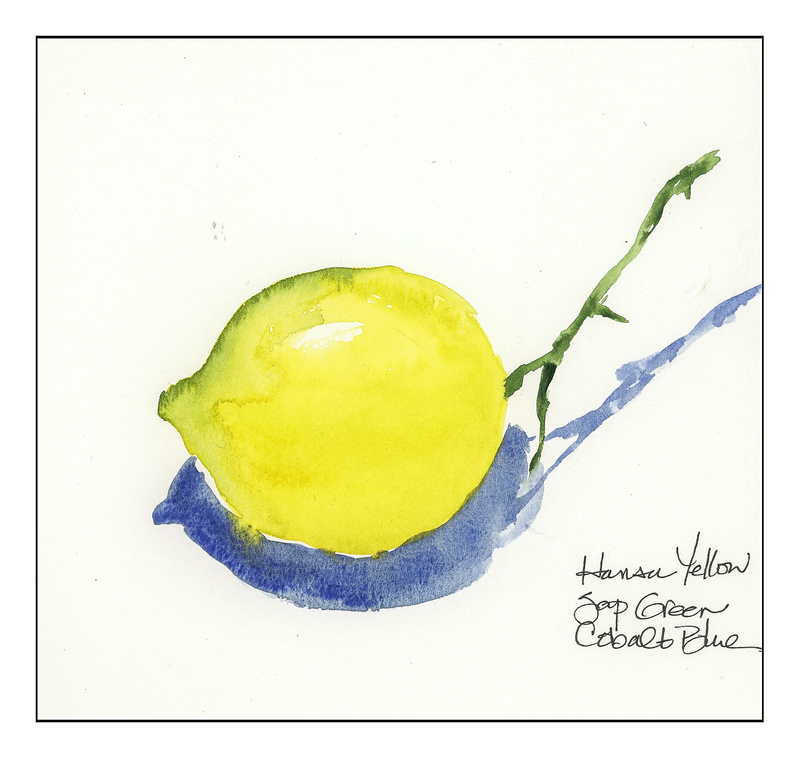 In this one, I used pure hansa yellow, sap green blended into the yellow, and cobalt blue for the shadows, with some bleed from the lemon. The stem was pure sap green. Heirloom tomatoes are always interesting – they are rather like aliens in the produce department! Again, limited palette with varying uses of the colors individually and mixed. Another alien, but this time I created a swatch of the colors as I did the painting. If you want to scroll through the paintings, click on an image above. I like doing that because I see things in a sequence. Anyway, I really got a better sense of the yellows and how I might use them. 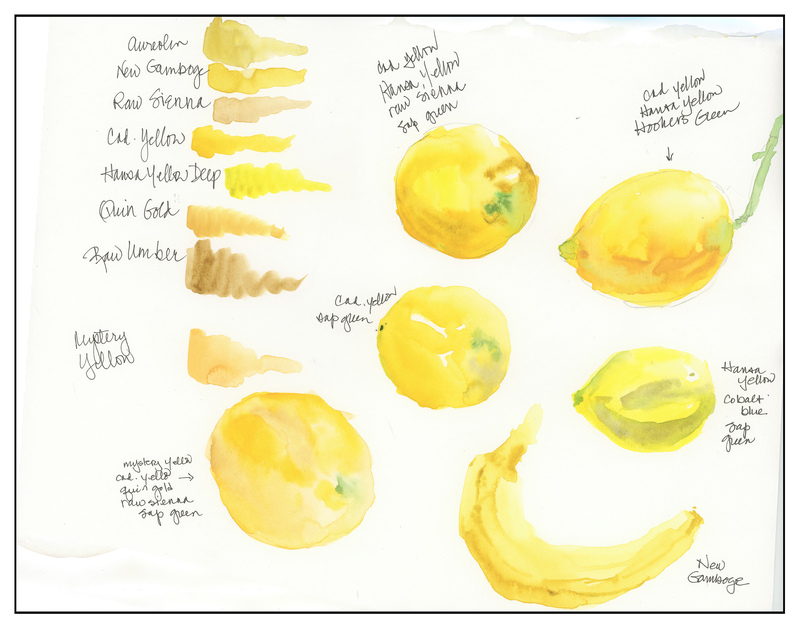 Cadmium yellow, hansa yellow, raw umber and raw sienna are my most-used yellows, but can see where others may be valuable, such as in shadows and so on. 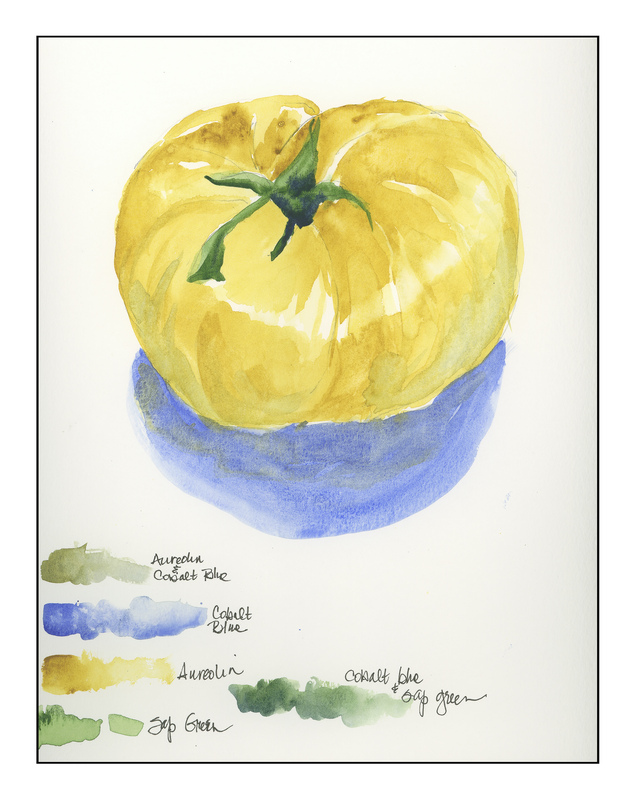 Hansa yellow is a cold yellow, in my opinion, and the warmth of the cadmium yellow cannot be beat. 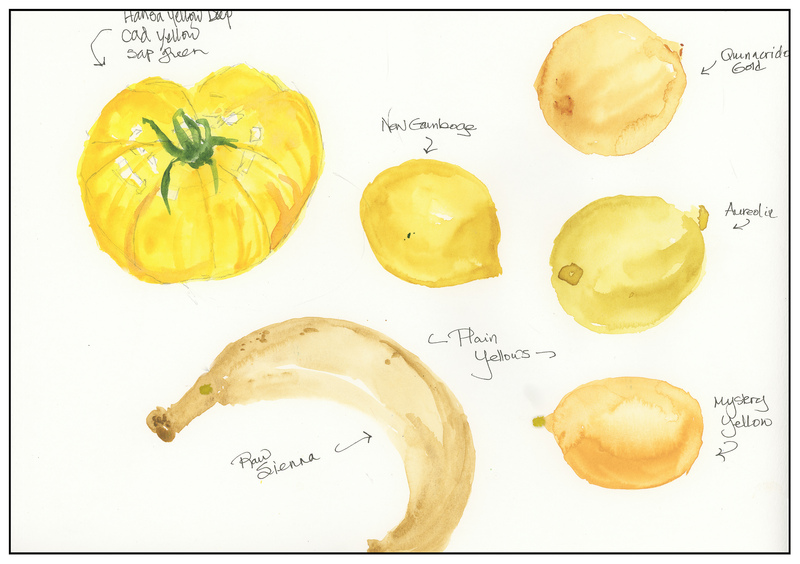 For rotten bananas, raw sienna isn’t too bad!